Here are some ways you can help Troopers Hill continue to be a beautiful place for people and wildlife. If you are a group or corporate volunteers please see our information sheet for Corporate or Group Volunteering (pdf) otherwise please keep reading. Activities range from an hour or less every 3 months to as much time as you want. Contact or ring 0117 947 5037 for more information about any of the opportunities listed below. Work parties - at work parties we cut back scrub in areas that are difficult for the Park Keeper’s machines to work. We do this to protect the acid grass and heathland from becoming overgrown and disappearing. We use shears, loppers and saws. Work sometimes includes repairs and litter picking. We supply the tools, free biscuits and hot drinks. Bristol City Council provides the insurance and training for our work party leaders. We do 2 hours work on the first Saturday and third Thursday of each month. Information about times, what to wear and previous work parties including more photos are on our Work Parties page. It's fun, friendly and sociable and there is no commitment to be at every work party. Events - our events are aimed at helping people to appreciate and value Troopers Hill as a very special place. We need helpers to plan, organise, write funding applications, fetch, carry, put up gazebos, sell soft drinks and be friendly and informative at the events we hold throughout the year. If you are willing to share your contact details, Susan will telephone or email as an event approaches and ask if you can help. Designing posters - we need bright, colourful, eye-catching, A4 portrait posters to advertise our activities. They should be suitable to print on a home printer. We advertise 6 meetings, 12 work parties and about 8 events through the year. Putting up posters - we put up posters in a limited number of local locations, both for Friends of Troopers Hill activities and the St George Strollers, our Walking for Health group. Volunteers to do this regularly would be very welcome. Meetings - we have meetings about every 2 months plus an Annual General Meeting. 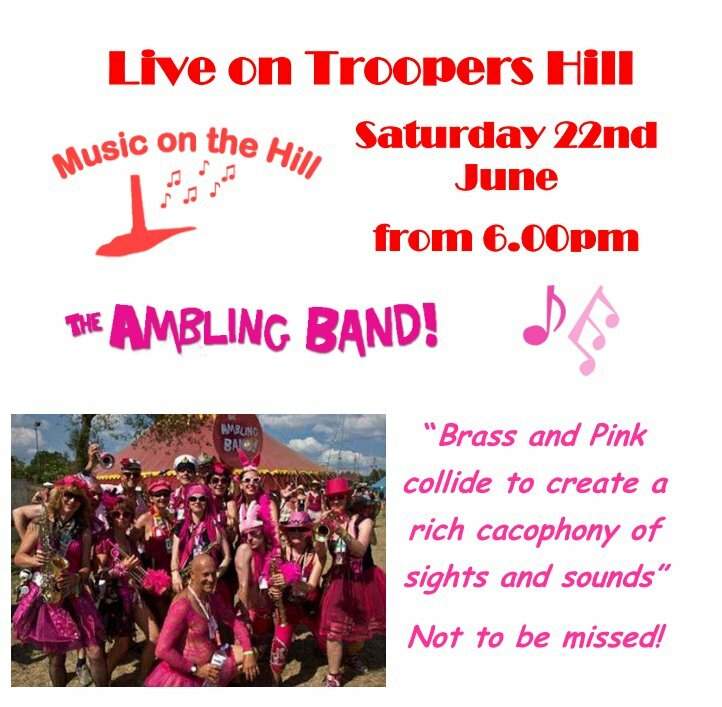 Friends of Troopers Hill need local people's input to be sure we are concentrating on the right things. Meetings are fun, informal and last no more than 2 hours. Minutes of previous meetings are on our Meetings Page. Walk Leaders - Our Walking for Health group, the 'St George Strollers' run regular walks in St George or in surrounding areas that can be easily reached by bus. The group was set up by Friends of Troopers Hill in May 2011. The group would welcome volunteers willing to be trained as walk leaders to help lead and plan walks. We always appreciate donations. Although we have been very successful in the past raising grants; there is always more that we would like to do and it is difficult to raise funds for running costs such as paper, ink, postage, meeting room charges, replacing tools and paying for our website name. There also the costs of the events we arrange. To make a donation either contact or make a cheque payable to "Friends of Troopers Hill" and send it to Treasurer, Friends of Troopers Hill, c/o 3 Corkers Hill, St George, Bristol, BS5 8DT.